I’ve pretty much failed at everything I’ve ever tried at least once and in some cases multiple times. Academically I wouldn’t have been identified as a more able pupil when I was at school and university; I learned to read late (according to my teachers), I struggled with ‘O’ Level Maths, wrestled manfully with Statistics at ‘A’ Level and just about survived my first year at uni, though admittedly that was largely down to my developing investigation into the properties of alcohol and a healthy interest in sport rather than lack of ability. I was deemed a risky pass when I attended the Army’s Regular Commissioning Board and to cap it all I’ve even taught the odd lesson that might have been a little shy of outstanding. But I don’t enjoy getting things wrong, or even readily admit that I have – ask my wife – and consequently I do sometimes take the easy option. But…..I do know that if you want to improve you have to be prepared to experiment and consequently there are going to be some mistakes. I am a curious person, I enjoy a challenge and I don’t give up until I’ve made some improvement. So I guess I’m a lover of learning. Closing the gaps is not sufficient however. Getting closer to the average is short sighted. What is required is a paradigm shift not a series of incremental improvements. In my opinion this could be achieved by shifting our attention to the front of the curve rather than focusing on the middle or tail. I didn’t share any thoughts pre-referendum but my voting intention was clear. In the days following the vote for ‘Brexit’ there have been thousands of articles written, millions of tweets posted and hours of TV/radio programmes all reflecting on what’s happened and why. Neither the result nor the subsequent analysis has changed my mind. There is now talk of the need to ‘move forward’, to ‘work together’, to ‘believe we can make everything better’. The sub-text being that to do otherwise is to ignore the will of the people, to act against the best interests of the country, to be unpatriotic. I consider myself to be a patriot and want every person in the UK to be safe and prosper but I will never share the views of many of the 17,410,742 who voted for, amongst other things, leaving the EU. I cannot in conscience work together with them or move forward on their agenda. The country is split and anyone who really thought the Referendum was going to achieve anything else was naive. I was not alone in being worried before the vote about the direction the debates were taking and the deep divisions within our society they revealed. For either side to claim that it was just a passionate debate between leaders who were respectful of each other or between well informed citizens acting in a rational way and also to say they expected that they would all be able to get on just fine afterwards was foolish. Quite apart from the fact that the many politicians simply inflamed the situation the discussions at every level were often far from rational and never solely about EU membership. Had the result been for Remain I would have been just as concerned as I am now about the deep divisions that so clearly exist within the UK. My mind has not been put at ease by the post vote comments of the current party leaders, leaders in waiting and other ‘wannabes. I am deeply cynical about the motives of all involved and I remain worried for the future of our country. It’s easy to appreciate the strength of feeling on both sides of the EU referendum. After all this is, in a way, much more important than any General Election. It’s an issue that will affect our lives not just for the next five years but over the course of our lifetimes. As it happens it seems it’s probably going to be more significant than even the most well informed political observers had imagined and I think we haven’t begun to fully grasp what the future holds for post Brexit generations. But let’s be clear, the results of the June Referendum must stand. The referendum was entirely legitimate, we knew well in advance that it was going to happen, had the chance to read up and inform ourselves of the facts and make up our minds about which camp we were going to support. There was a good turnout (relatively speaking) and very few ballots were discounted. Putting the quality of the campaign and integrity of the chief protagonists aside the whole process worked just as intended. So, the results must stand. However let us also be clear about a couple of things. Firstly the result was far from the overwhelming victory that is now claimed by some campaigners and suggested by careless journalists. Claims that the ‘people have spoken’, that ‘52% of the population voted out’ and that this in some way means we must expedite the result without further debate is perhaps the most un-British approach possible. Only some of the British people have expressed an opinion. The number of people registered to vote by June 2016 was 46,501,241 (BBC figures), an increase on the ONS figure for 2015 of 44,722,000. Turnout for the Referendum was 71.8% (33,551,983) and the Leave vote secured 51.9% (17,410,742) of the ballots cast. The difference between leave and remain was 1,269,501 votes. But lets remember that the population of the UK is approximately 63 million and all of them will be affected by the eventual decision regarding Britain’s future position in the European Union. So whichever way you cut it it’s difficult to see how the ‘British people have spoken’ or indeed that ‘52% of the population have voted out’. But I grant you 17,410,742 people together represent a sizeable slice of the British pie and their collective howl against the EU was deafening. The political elite were immediately falling over themselves to say they recognized the need to listen to the people only to withdraw very hastily into their Westminster bubble to plan/plot their next move and simply reinforce the view that there is a fundamental disconnect between the people and their representatives. And this is the second point, they are our representatives. The British political system is not without its faults. Nevertheless we are fortunate indeed to have a system of representative democracy not pure direct democracy. Our system is not based on the principle that the loudest voice must be listened to without question while the quiet folk or those without a voice are ignored. We elect MPs to make decisions in the best interests of all their constituents (the ones who voted for them, against them or not at all) and, more importantly in the best interests of the nation as a whole. Some MPs clearly take their responsibilities very seriously working tirelessly to help the people in their communities and voting intelligently on matters of national importance. OK, at the moment they need to sort out which unfortunate is going to take the helm next but as the blood letting, resignations and petty partisan manoeuvring continues, the markets seethe and the big property funds draw the deadbolts across their king sized piggy banks I’m growing increasingly worried that they’ve forgotten what they’re paid to do. Her Majesty’s Government and Opposition should govern in the best interests of the nation; how can they claim to do this without fully debating the most pressing issue of the day in light of the referendum results and subsequent turmoil? We all voted with the very best of intentions in June. We were all thinking of our families, our communities, our regions and our countries when we placed our cross on our ballot paper. But we are not paid to make choices that will affect the lives of millions of people across the length and breadth of the British Isles. We have not been elected and are not directly responsible for the future of Great Britain. That is the heavy burden shouldered by the 650 Members of Parliament who represent every last citizen in the United Kingdom. It’s ironic that we all listened so closely to arguments about the danger posed by the EU to the sovereignty of Parliament but today we’re about to allow just 149,000 members of the Conservative Party to elect a Prime Minister who may seal the fate of our nation without consulting Parliament. When tough decisions about the fate of my nation need addressing I’d prefer as many MPs as possible to have the opportunity to represent the views of all their constituents. I’d be worried if the loudest voice drowned out everything else or the executive acted alone. There’s a reason we have a Parliament. There’s a reason why our elected representatives usually debate key decisions. When Parliament is bypassed trouble follows. There must at the very least be further Parliamentary debate about our future in Europe and ideally a General Election shortly after. The paper ‘Surfing, sinking and swimming’ outlines the differences between surfing, swimming and sinking. Does this resonate with your own experience? Binney, G, Wilke, G & Williams, C, 2005, Living Leadership A Practical Guide For Ordinary Heroes, Harlow, Prentice Hall. Phew! For a moment there I thought I’d better come clean, admit I was a fraud, and quietly exit the NPQSL course. If you’ve had a week like mine then you’ll probably have cycled through all three of these feelings every day and possibly even within one lesson. In fact Wednesday was particularly tough so I’d chalked up all three by break time! And it turns out that this is fine…..result. There are any number of reasons why we might be finding it difficult to get into that surfing/flow state but let’s just focus on one culprit for a little while. There is simply too much to do! Or to look at it another way we’re trying to do too much….on our own. Triability: the change should be something that people can try on a step-by-step basis and make adjustments as things progress. It strikes me that reasons 1-6 may be founded on the belief of the resisting individual/group that the change is being imposed on them. It is also quite common to encounter challenge/blocking, or passivity/neutrality because of a view that “we don’t get paid (enough) to do that, it’s not our job, we’re not the leaders”. I’m not altogether convinced that some of the criteria are always appropriate; after all if the established habit, values and experience of an organisation are the reason it’s in a pickle then you’d be ill advised to pander to them. It’s clear that the ‘creating the climate for change’ and the ‘engaging and enabling the whole organisation’ phases should be powerful agents in overcoming the view that change is being imposed. The article I’ve just read actually points out that inexperienced leaders often jump to the last few steps without having prepared the ground and consequently face resistance. It also seems reasonable to assume that many of the barriers identified by Schermerhorn would also be addressed by the Kotter Model. Win the hearts and minds. Effective change is founded on an effort based on a 60/40 split between the two. Ok, so how does that help me? To me this means it’s not just about getting people to ‘like the plan’ or even for them to ‘buy-in’ to the task or change being proposed. For really effective teams there has to be something more. Let me turn briefly to my past experience. lly stepping into an alternative reality”. I’m was intrigued to learn how as a senior leader one might attain this almost ecstatic state. Csikszentmihalyi suggests that this can only happen when someone has been very well trained and developed technique but that flow is achievable by everybody because it is essentially about balancing levels of challenge and skill. He develops the idea further by identifying the flow channel as being the essential basis for continued personal improvement. He introduces several other states: apathy, boredom, relaxation, control and arousal which essentially form a continuum with the flow channel being between control and arousal. Clearly if you’re at the one end of this you’re neither inspiring yourself or capable of leading others. We need to be operating at the optimal level. Being in control is a comfortable place to be but its not exciting. If you want to enter flow from control you have to up the level of challenge Moving from the flow channel to arousal (pushing yourself beyond your comfort zone) and back again to flow is where you develop higher skills. If you judge this process of flexing from one state to another and back again you should raise the flow threshold and in so doing increase your capacity for further development. I kind of imagine it a little like building strength in a muscle. As the introductory ‘thinkpiece’ to the module suggests the key skill therefore is a commitment to self-learning and ‘stretch’. It is clear how Kolb’s Learning Cycle in tandem with Boyatzis’s ideas on Self Directed Learning and the use a solid coaching model can help anyone accurately evaluate their current level of skill, identify suitably challenging targets and so more routinely operate in the flow channel. But what about creating conditions not just for an individual to achieve flow state but also a group or organisational to do the same? This has to be the ultimate aim in order to create “networked, self-organising and self-managing institutions, which support the development of a rich leadership capacity at all levels within the school.” A leader will not only attend to their own personal and professional growth but also pay close attention to the people within the team……it’s not rocket science really and John Adair‘s model of task, team, individual is just as useful. We’re always explaining to pupils that they need to be good listeners but do we always model that good behaviour ourselves? Although we all like to think we’re good at listening to other people it’s interesting how sometimes other people don’t feel as though they’re being listened to. Developing this skill allows us to understand the needs of others, adapt our approach accordingly and so influence others in a more considered manner. Indeed getting better at seeing ourselves as others see us is an essential leadership quality. Accurately gauging the impact you have on other people is essential in forming and developing effective teams whose goal is continuous improvement. Of course there are limitations to using these sources exclusively. The school and department feedback is by its nature general and requires you to draw inferences which may or may not be valid to a particular teacher. In the PM process we’re reflecting on our our own performance generally using statistical measures to help us set new targets; there is little in the way of objective qualitative feedback. Will my students see things in the same way I do? and these are further divided into 9 key leadership competencies. These really flagged up some pretty important elements that I need to keep in mind and the final Summary Form and Action Plan have provided a very focussed baseline from which to move forward. Talking to colleagues who have come to teaching after working in other fields, business etc. it seems that the 360º Diagnostic Model is quite a common tool. I think it would be useful to have a similar tool within the PM cycle and wonder if there are already schools who have adopted this model? Three and a bit weeks into the new term and having ‘changed up through the gears’ I’m back into the swing of things again; seen all my classes, starting to match names to faces and just about got my head round the new timetable. The start of the new academic year is obviously an important time for many reasons but amongst these is the fact that it is an absolutely crucial time for building what I think of as learning bridges. 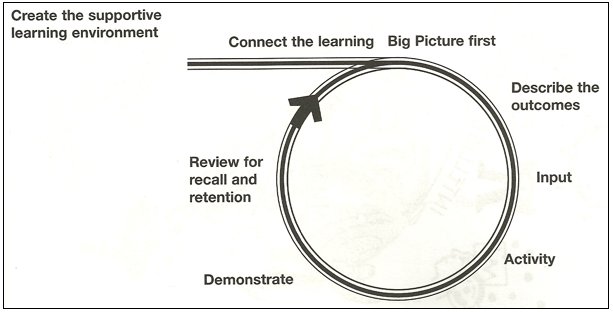 Alistair Smith’s work on accelerated learning describes this as connecting the learning and, after a long summer break, it makes perfect sense that pupils and teachers should invest time reviewing what was being covered in the previous academic year and how it fits together with what is to be covered in the coming year. Our KS3 scheme of work is based around five themes: Ideas & Beliefs, Conflict, Empire, Ordinary life and Power. We return to these themes regularly over throughout KS3 with the aim that pupils will finish the KS with a big history firmly rooted in their heads. Where they often struggle however is in seeing the links between the different years of study; they seem to think that just because they are in Y8 they don’t have to think about what they studied in Y7. Well of course they get reminded of previous work as we chart our way through a new year but it’s as well to start as you mean to go on. So, with this in mind, I’ve spent a bit of time getting my classes to review their work from last year and note down the Big Points that they have remembered. Certainly not groundbreaking nor rocket science but hopefully a sound investment for the rest of the year.